Kimberley is a small village (population under 150) nestled in the heart of the Beaver Valley in the Grey Highlands of Ontario south of Collingwood. The Beaver River flows north through the valley through the village of Clarksburg to the town of Thornbury on the shores of Georgian Bay. If you want to explore the area, many stores in the area carry a free detailed Grey County map that shows all the routes and main attractions in the area. Local points of interest are marked on our Google map. Kimberley nestled in the Beaver Valley. The Bruce Trail surrounds the valley on both sides along the Niagara Escarpment, which is a UNESCO World Biosphere Reserve. A short walk on the Bruce Trail will take you to the lookout on a large cliff called Old Baldy from which you can see the whole valley, including Kimberley and the house. 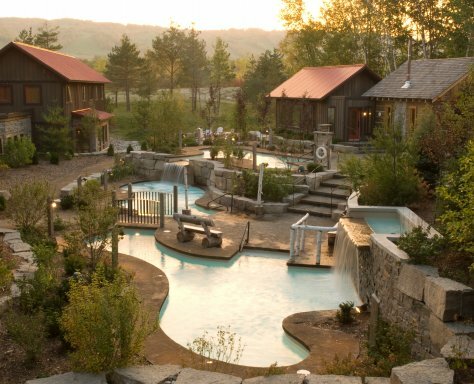 Located just 15 minutes south of Kimberley is the village of Eugenia and the beautiful Eugenia Falls, while another 10 minutes south will take you to Flesherton with its charming stores. Thirty minutes to the north is Collingwood and the ski slopes of Blue Mountain a little to the east, or the village of Clarksburg and the town of Thornbury a little to the west. Here are some attractions in the Kimberley area that you may want to explore on your visit. These destinations are just a five minute walk from the house. 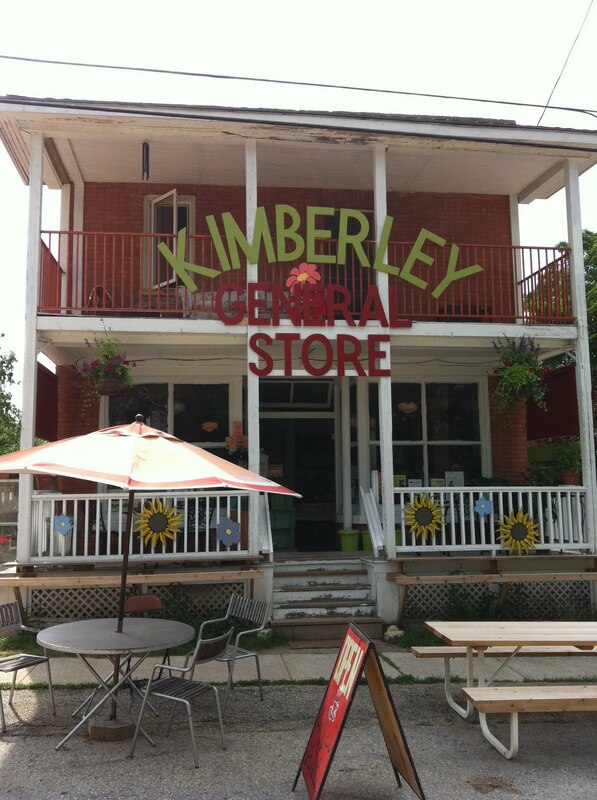 Kimberley General Store – voted the best in North America – is where you will find everything from a soup and sandwich, wooden toys for kids, organic local produce to used books. Sit on the front porch or screened gazabo and enjoy a meal, or take advantage of their free wifi. Friday nights enjoy wood fired gourmet pizza. 235304 Grey Road 13. Check out this article or watch this great short video. Kimberley’s library has been lending books since 1896. Open three days a week, it is located in the historic Kimberley Community Hall at 235309 Grey Road 13. Do look out for the whimsical collection of painted bicycles scattered through the village of Kimberley. Beaver Valley Orchard and Cidery produces hard cider from local heritage apples, and offers tastings in their renovated heritage barn a few minutes north of Kimberley at 235853 Grey Road 13. Old Baldy Lookout and Conservation Area provides a short trail and a panoramic view from a cliff 152 metres above the Beaver Valley. Rock climbing is also available on the cliff face by permit. The Beaver Valley Bruce Trail club is active in maintaining the over 100 km of trails that run through the Beaver Valley. They organize regular events and hikes, and offer patches for completing portions of the trail. There are many access points to the trail only a short drive from the house. Many of the trails are accessible for cross country skiing or snowshoeing in the winter. If you are a gardener, check out Fiddlehead Nursery just a few minutes north of Kimberley at 235599 Grey Road 13. It specialises in edible, perennial plants with an emphasis on cold-hardy, disease-resistant varieties, and on plants that serve multiple purposes in the landscape. 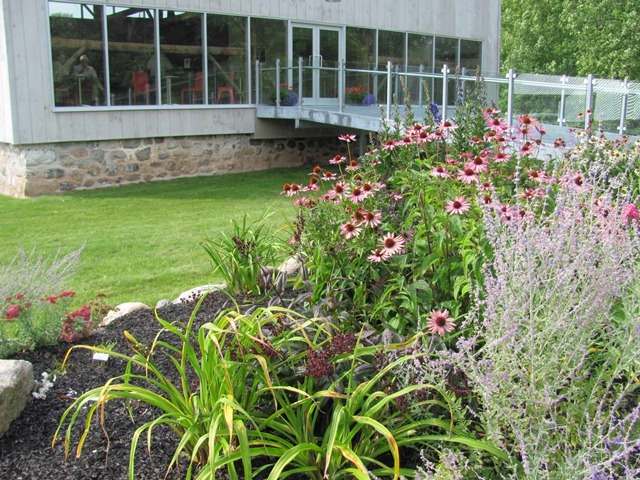 Even if you don’t garden, be sure to visit the beautiful gardens at Artemesia Daylilies, just four km north of Kimberley at 235731 Grey Road 13. They have a selection of 800 exciting daylily cultivars, including their own hybrids, for sale. 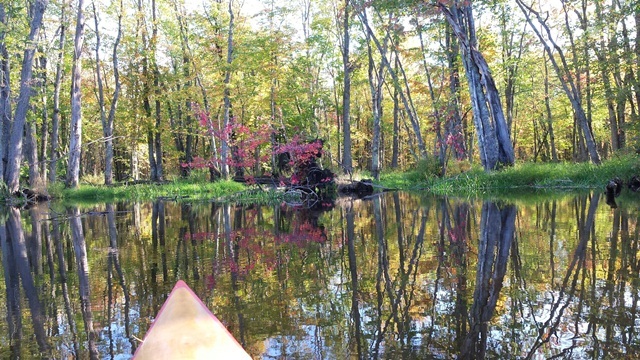 Canoeing and kayaking are beautiful on the Beaver River: a canoe map and information are available There are five access points for you to enter the river. You can rent canoes and kayaks on the Beaver River through Free Spirit Tours. 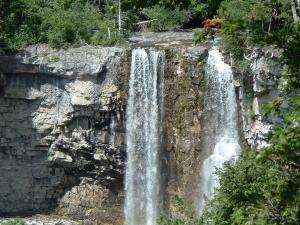 Eugenia Falls, at 30 metres, is the second highest waterfall in Ontario next to Niagara (53 metres). A pretty conservation area, lookout and trail are easily accessible from the village of Eugenia, just 10 minutes south of Kimberley. The ruins of Hogg’s first power plant can be seen from the lookout. The current Eugenia Hydro Plant is located in the Beaver Valley. As you drive north from Euphrasia on Grey Road 13, watch for the tall surge tanks at the crest of the valley. On your right you can see the large pipes that carry water down from Lake Eugenia, under the road and down the steep slopes to the generating station in the valley. Hoggs Falls is a picturesque waterfall at the end of a beautiful drive in the southernmost, narrow part of the Beaver Valley, along the route of the Boyne river. Lake Eugenia is great for boating, and offers a beach, fishing and a boat launch. Downhill skiing is available to members at the private Beaver Valley Ski Club but Kimberley is only 30 minutes from Blue Mountain near Collingwood if you want to hit the slopes. 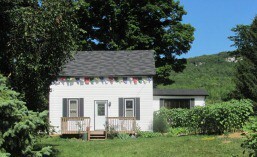 Clarksburg is a quaint village in the Beaver Valley north of Kimberley on Grey Road 13. It is an art centre with theatre, music, art shows, galleries and historic Victorian homes. You can visit the old fashioned hardware store, a honey store or walk the nature trails. The town of Thornbury is located at the end of the Beaver River on the shore of Georgian Bay. A great place to shop for art, pottery and antiques. For a quiet break, you can also walk the labyrinth in Thornbury. Meaford’s Memorial Park has a great family beach on Georgian Bay. There are a number of wonderful farmers markets in the area from June through October. Check out Meaford Fridays 3 to 7 pm where you can buy Ironwood Organic Coffee, Thornbury Sundays 11 am to 2 pm, or Collingwood Saturdays 8:30 to 1 pm. Collingwood is located just 30 minutes away on the shore of Georgian Bay. The town has a thriving art community, with a number of galleries downtown. Collingwood is a great retail destination for fine dining, clothing, home decor and interesting gifts. Why not also consider taking a break at the Scandilave Spa.